Whether you are rooting for the Eagles or the Patriots I have some fun goodies that you can whip up for the big game. Combine yeast, warm water and sugar in a stand mixer with a hook attachment until "frothy." When the mixture is "frothy" the yeast is ready. Stir in salt and unsalted butter. Add flour a cup at a time until a dough forms and is no longer sticky, you may need to add more or less flour depending on your mixture. Knead dough for 5 minutes until the dough is smooth. Form into a ball, place back in bowl and let rest for 15 minutes. While the dough is resting mix two cups of water and 4 tablespoons of baking soda together and bring to a boil. Once the majority of the baking soda has been dissolved, remove the mixture from heat and let the mixture cool to a lukewarm temperature. Pour the cooled mixture into a shallow dish and set aside. Remove the rested dough from the bowl and slightly pat down with your hands. Cut the dough into eight sections like a pizza. Take each triangle section and roll into a 19-20 inch rope. 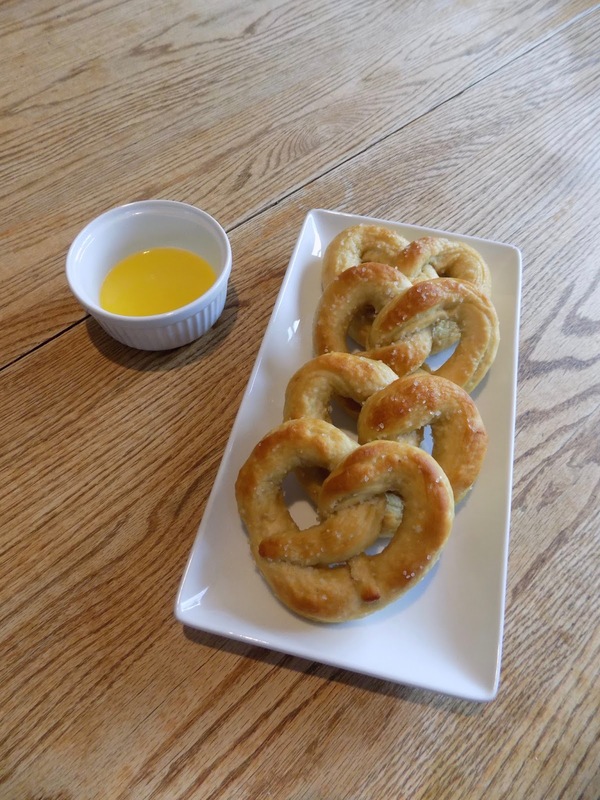 Fold dough into a pretzel shape and place into the baking soda mixture for two minutes. After the pretzel has soaked, place onto a parchment paper lined baking sheet. Reshape the pretzel if needed. Top the pretzel with coarse salt while wet, if desired. Repeat until all eight pretzels are prepared. Bake pretzels for 8-9 or until golden brown. Remove from oven and immediately brush with 6 tablespoons of melted butter. This was the first time I made homemade pretzels. They aren't difficult to make but are a little time consuming. Whisk flour, baking soda and salt together in a large bowl and set aside. Beat shortening, sugar, brown sugar and vanilla in a large mixer bowl until creamy. Gradually mix in the dry mixture until well combined. Place tablespoon sized balls of dough onto an ungreased baking sheet. Remove cookies from oven and immediately press M&M's into warm cookies. My family is all about the chocolate chip cookie recipe on the back of the nestle chocolate chip bags. I have come to find that it is the perfect base dough for other cookies as well. Instead of chocolate chips I used M&M's in teams colors. Also, we substitute shortening for butter in the Nestle recipe. 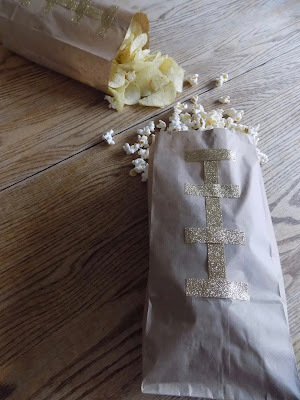 Using the tape of your choice cut a six inch strip and place vertically down the middle of the bag. Cut four three inch strips and place horizontally on top of the strip down the middle to replicate the seams of a football. One on the top, two evenly spaced in the middle and one on the bottom. Fill the bags with your desired treats. This treat is super easy mode. My bags turned out a little more glam than I had originally planned when I realized the only tape that fit the theme was my gold Washi tape. I put a few crinkled up paper bags in the bottom to take up space and to help them stand up. The bag can hold quite a few snacks and you don't want to give all of your chips to one person. I will probably cut my bags down for the game on Sunday. I also thought this would also be a great bag to give to the kids. You can fill it with healthier snack options, plush footballs and activities to keep them occupied during the game. Erik and I are excited to chow down on these snacks during the game. What does your family make for the big game?